Your Dream Estate is here! With over 4500 sq. ft. of living space, this ranch style, brick-faced home sits on approximately 22 +/- acres of land located directly on the Caloosahatchee River with approx. 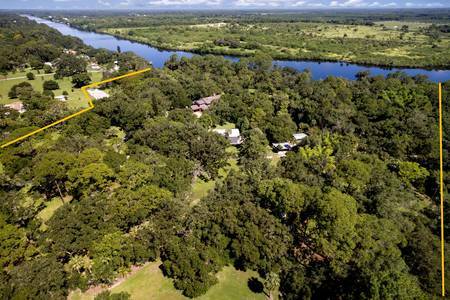 1,250 +/- feet of river frontage which includes an island. This property consists of countless mature oak trees, gazebos, several fruit trees, picnic areas, a boat house and a creek runs through the property and feeds into the river as well. Other features include a 3 car detached air condition garage, 32 x 65 metal building with 3 12x12 and 1 14x12 overhead doors, boat docks and carport and a 20 KW backup Generator. The grounds have been professionally maintained. This could be a full-time residence, winter retreat, or potential development site. There are so many possibilities for this property. Located on the Intracoastal Waterway 25 miles east of Fort Myers. This riverfront estate is on the Okeechobee Waterway which stretches from The Gulf of Mexico to the Atlantic Ocean, with Lake Okeechobee in between. An idyllic setting with 2 docks for boating.